As the name suggests, the Sai Satcharitra is a compilation of Shirdi Sai’s charitra or life stories and teachings as they occurred during the tenure of the writer’s association with Baba. This work by Sri Anna Saheb Dhabholkar alias Hemadpant, an ardent devotee of Baba, is exceptional since the concept for the book was blessed by Baba himself before the writer took up the writing. 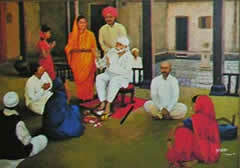 Sri Hemadpant thought that the description of these grand miracles of Sai Baba would be interesting, and instructive to His devotees; and would remove their sins, and so he started about collecting Sai Baba’s teachings and expressions – the outcome of His boundless and natural self-realization. Sai Satcharitra is published by Sri Shirdi Sai Baba Sansthan in various Indian languages and in English. It is included as part of this website for the benefit of the devotees who do not have access to paper copies of this Holy book. Links to all the chapters in the book are provided below.